Tony Chu is a cibopath who can get psychic impressions from anything (or anyone) he eats. This served him well as a police detective, and he was later recruited by the FDA. Chew is set in a world where all poultry meat is outlawed because of a catastrophic bird flu outbreak, which is why the FDA is now the most powerful government agency. Tony looks like a perfectly generic government agent: black pants, blue dress shirt with the sleeves rolled up, black neck tie, and his badge on a chain around his neck. 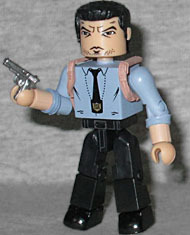 He has a tan shoulder holster, and a silver pistol. The design of the face looks just like Rob Guillory's art. It's just a shame he couldn't come with a fork or something similar. Chu's partner John Colby was badly injured and given cybernetic implants. Now able to talk to machines, he was partnered with the ferocious fighting rooster Poyo at the USDA. He was, and yet he too is wearing an FBI badge. On the fun side, that means Tony and John might hang out with other FBI agents you might know. He wears a fur-trimmed jacket over jeans and a V-neck, and like his partner, has a silver pistol. 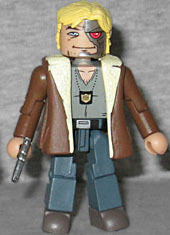 His shaggy blonde hair spills over his half-cyborg face, making him quite the non-traditional government agent indeed! Also, notice that, like most characters in Chew, his name is a food joke. 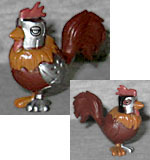 The set also includes the USDA's doomsday weapon, Secret Agent Poyo. Originally just a champion cockfighter, Poyo was shot by a terrorist leader, and got cybernetic upgrades similar to Colby's. He wears a lucha mask that looks a lot like Bane's, and has a robotic left eye, wing and leg. He's a solid, unarticulated piece, but has a nicely detailed sculpt. He does seem to be missing some paint apps, though: the black on the mask should go all the way around his head, and his robotic eye should be red. This little rooster needs a touch-up.